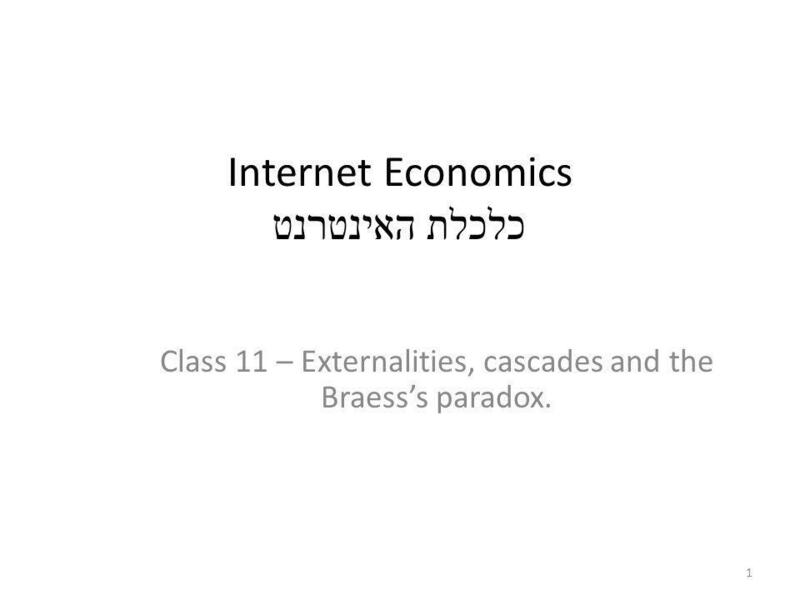 Internet Economics כלכלת האינטרנט Class 11 – Externalities, cascades and the Braesss paradox. 1. 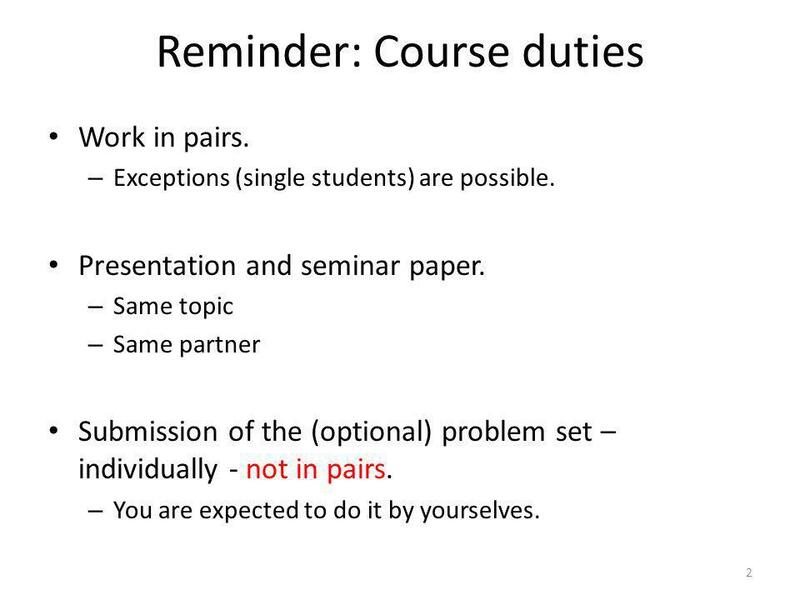 2 Reminder: Course duties 2 Work in pairs. 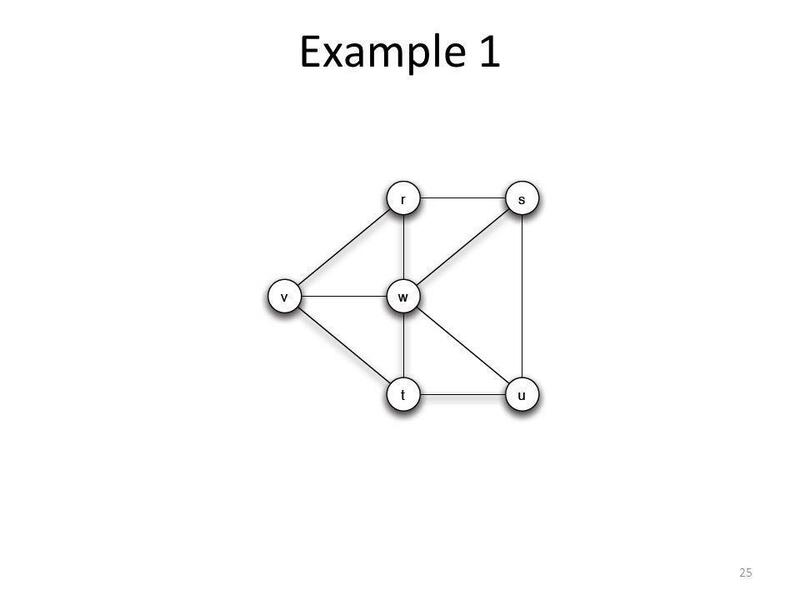 – Exceptions (single students) are possible. Presentation and seminar paper. 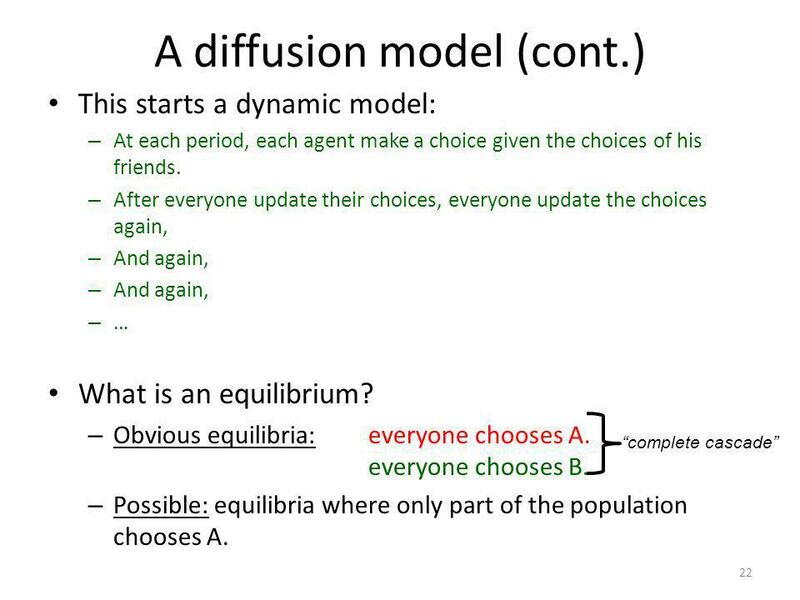 – Same topic – Same partner Submission of the (optional) problem set – individually - not in pairs. – You are expected to do it by yourselves. 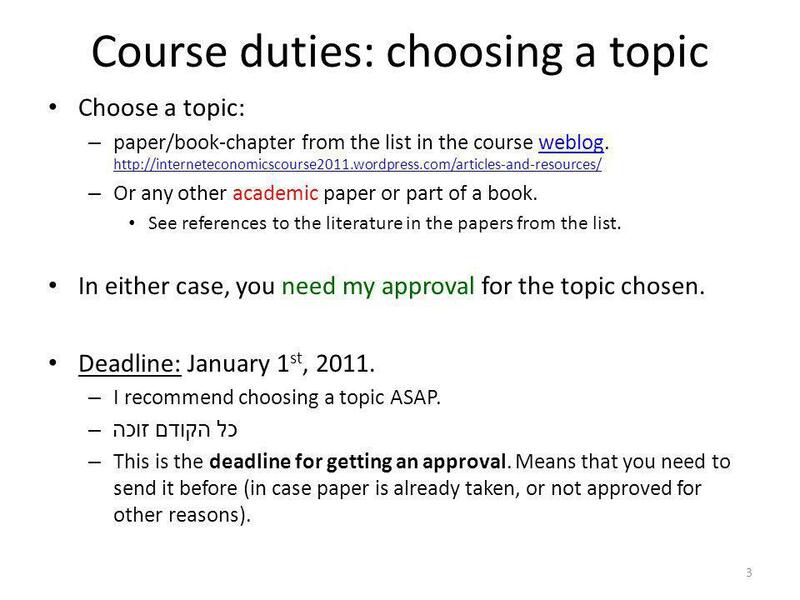 3 Course duties: choosing a topic 3 Choose a topic: – paper/book-chapter from the list in the course weblog. 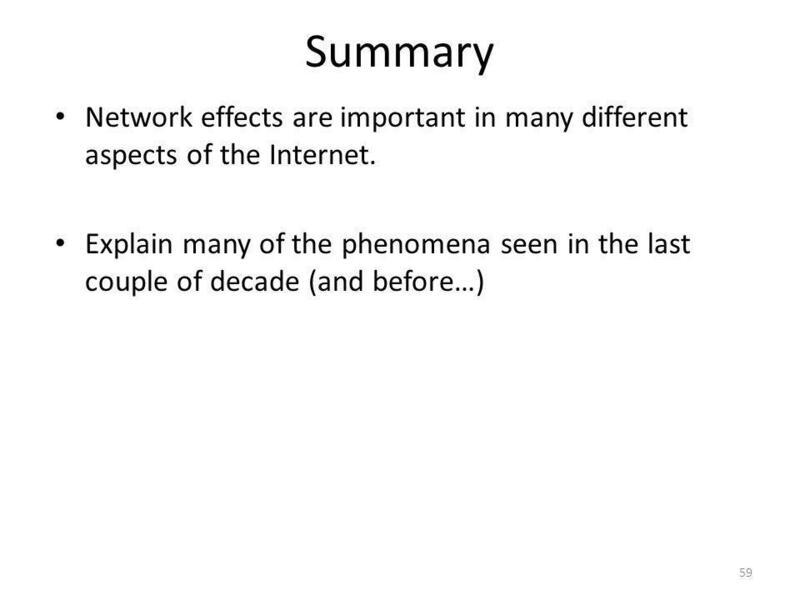 http://interneteconomicscourse2011.wordpress.com/articles-and-resources/weblog http://interneteconomicscourse2011.wordpress.com/articles-and-resources/ – Or any other academic paper or part of a book. See references to the literature in the papers from the list. 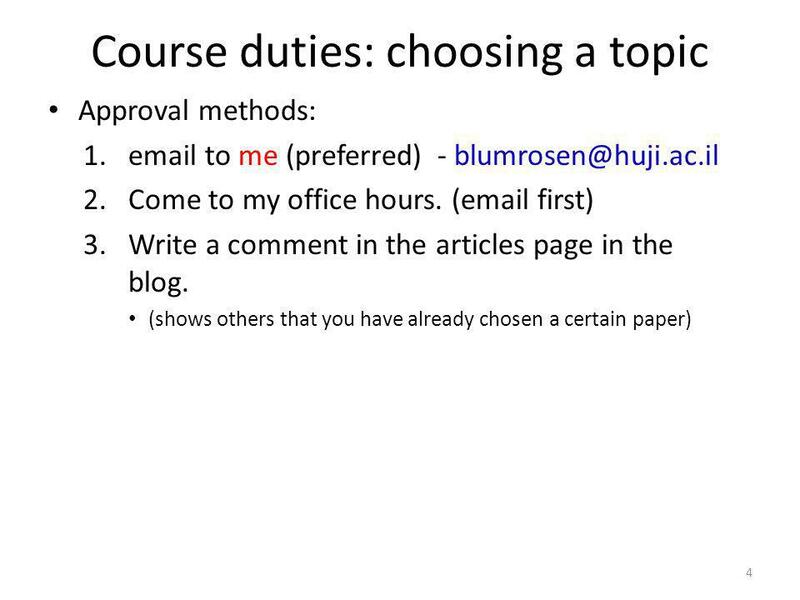 In either case, you need my approval for the topic chosen. Deadline: January 1 st, 2011. – I recommend choosing a topic ASAP. –כל הקודם זוכה – This is the deadline for getting an approval. Means that you need to send it before (in case paper is already taken, or not approved for other reasons). 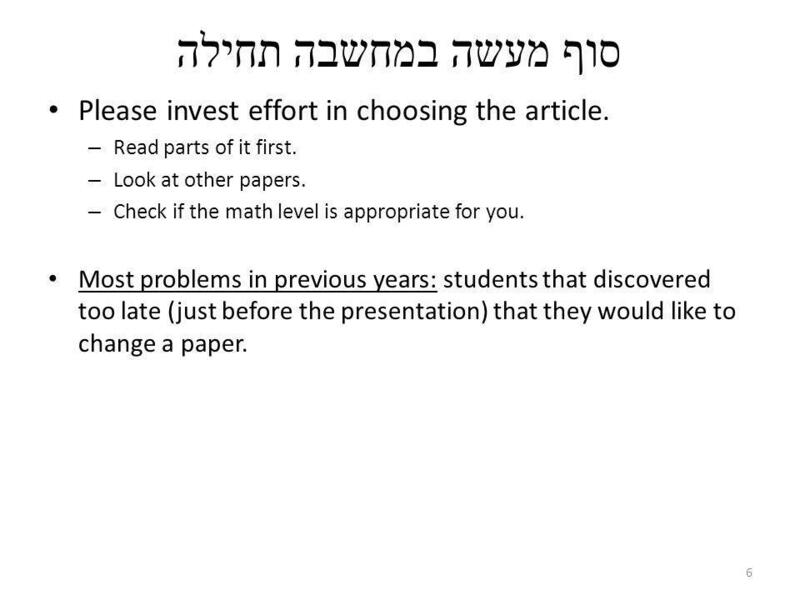 6 סוף מעשה במחשבה תחילה 6 Please invest effort in choosing the article. – Read parts of it first. 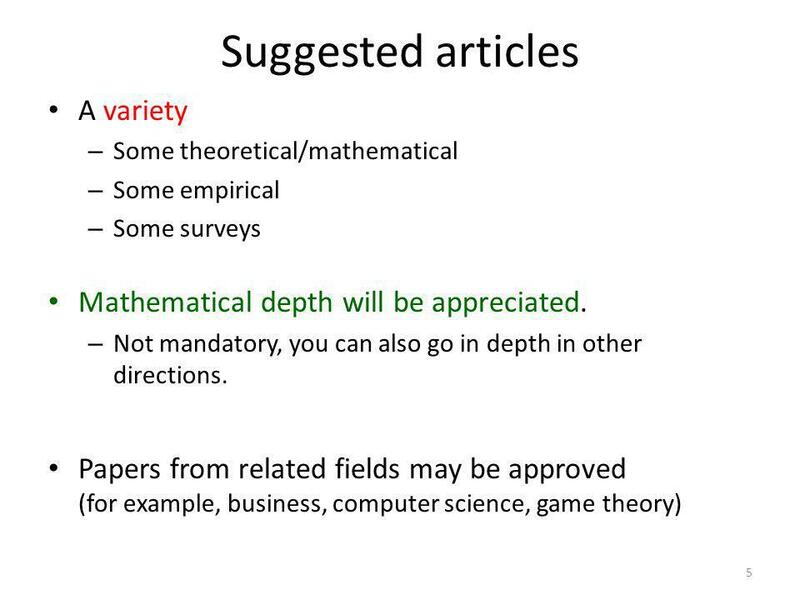 – Look at other papers. – Check if the math level is appropriate for you. Most problems in previous years: students that discovered too late (just before the presentation) that they would like to change a paper. 8 Time constraints 8 We will schedule the presentations during the semester break. Please send your hard time constraints (miluim, ski vacations, (your own) weddings). – To Avi, by Januray 12 th in the same email as the outline of the presentation. 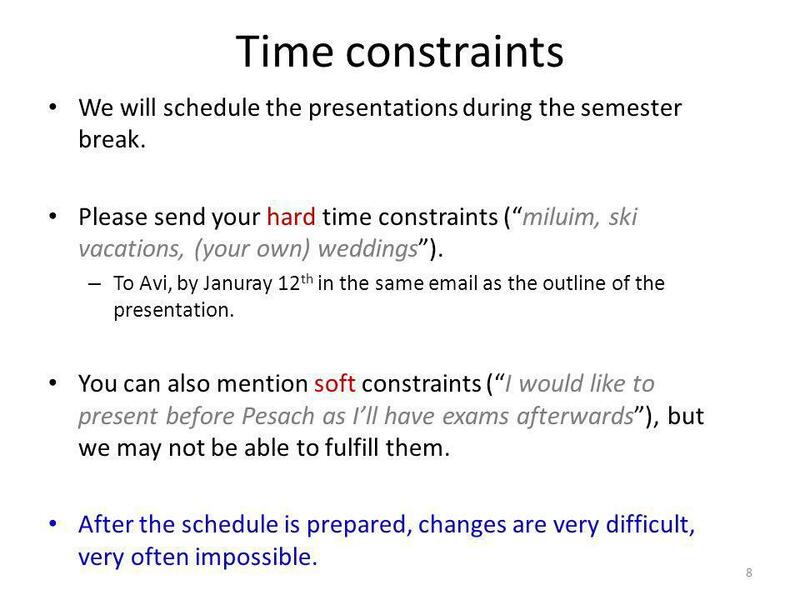 You can also mention soft constraints (I would like to present before Pesach as Ill have exams afterwards), but we may not be able to fulfill them. After the schedule is prepared, changes are very difficult, very often impossible. 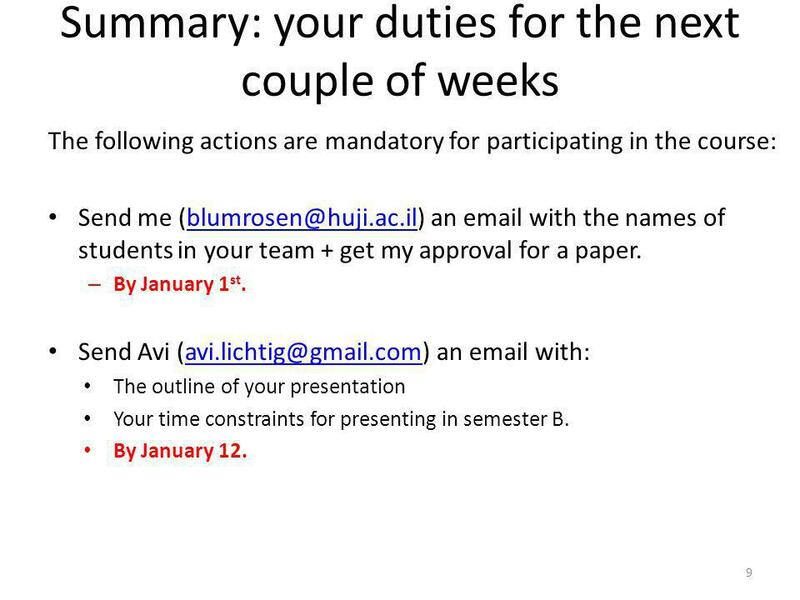 9 Summary: your duties for the next couple of weeks 9 The following actions are mandatory for participating in the course: Send me (blumrosen@huji.ac.il) an email with the names of students in your team + get my approval for a paper.blumrosen@huji.ac.il – By January 1 st. 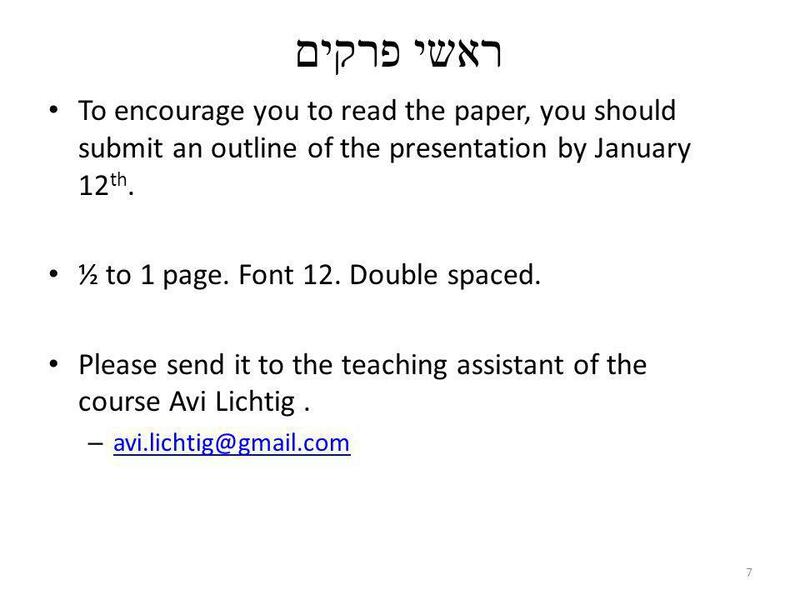 Send Avi (avi.lichtig@gmail.com) an email with:avi.lichtig@gmail.com The outline of your presentation Your time constraints for presenting in semester B. By January 12. 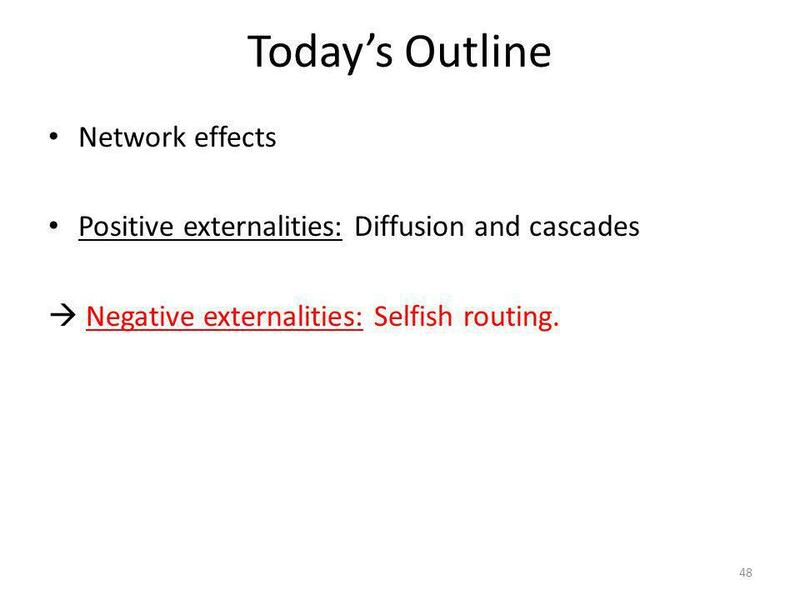 10 Todays Outline 10 Network effects Positive externalities: Diffusion and cascades Negative externalities: Selfish routing. 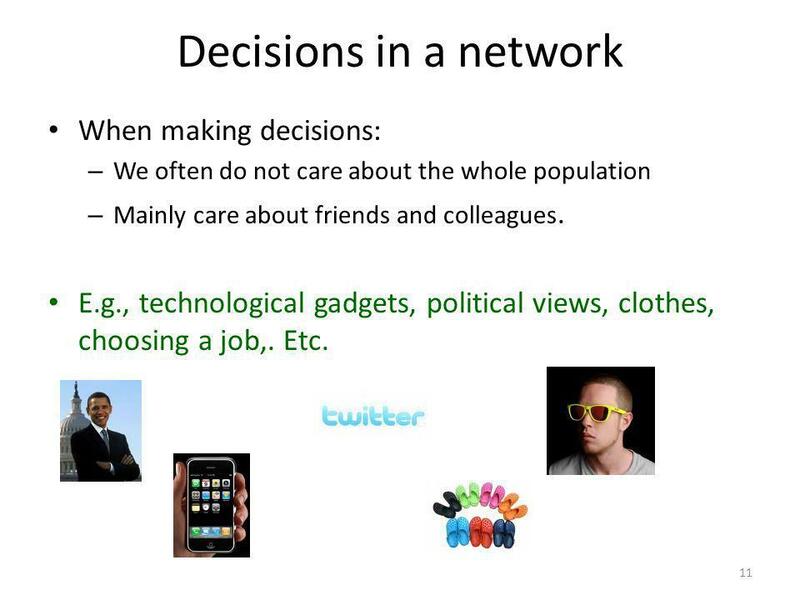 11 Decisions in a network 11 When making decisions: – We often do not care about the whole population – Mainly care about friends and colleagues. E.g., technological gadgets, political views, clothes, choosing a job,. Etc. 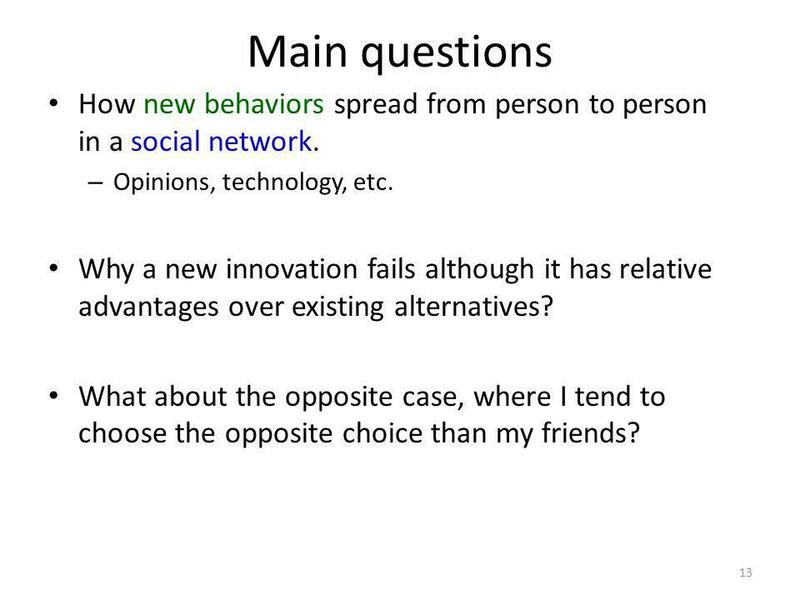 13 Main questions 13 How new behaviors spread from person to person in a social network. – Opinions, technology, etc. 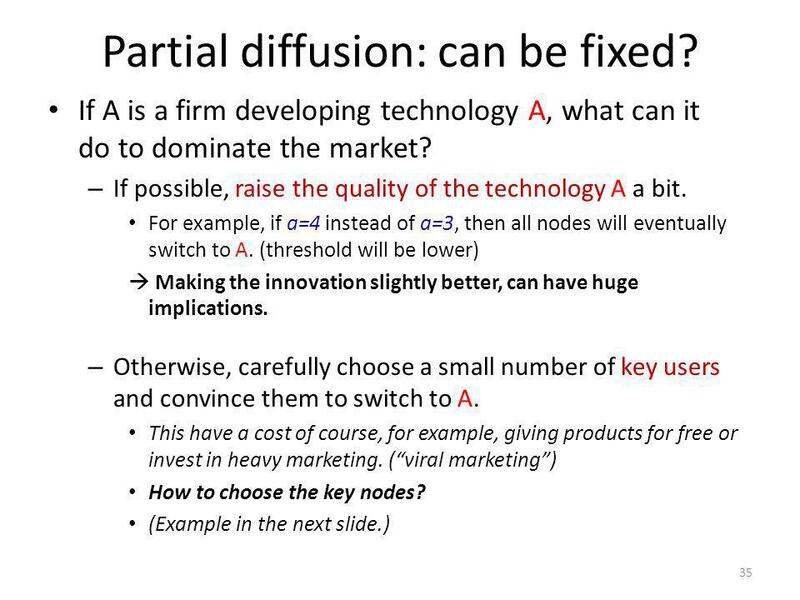 Why a new innovation fails although it has relative advantages over existing alternatives? 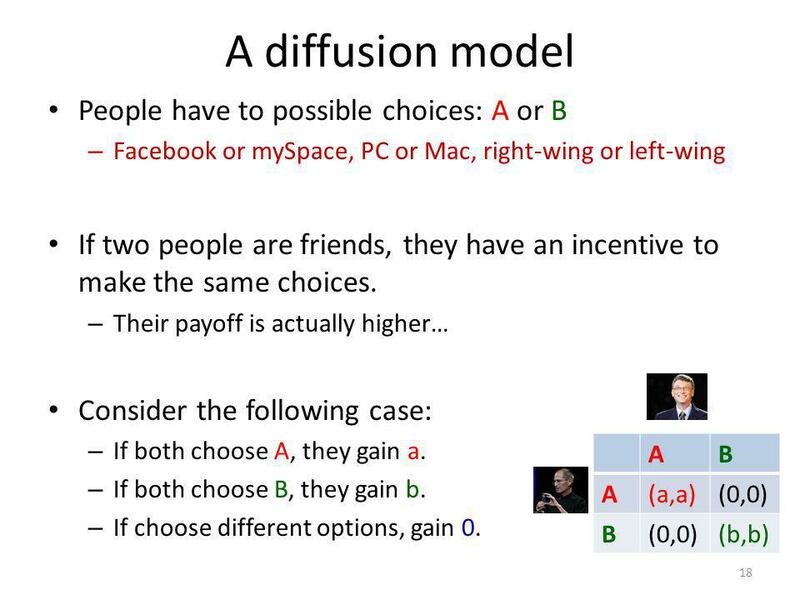 What about the opposite case, where I tend to choose the opposite choice than my friends? 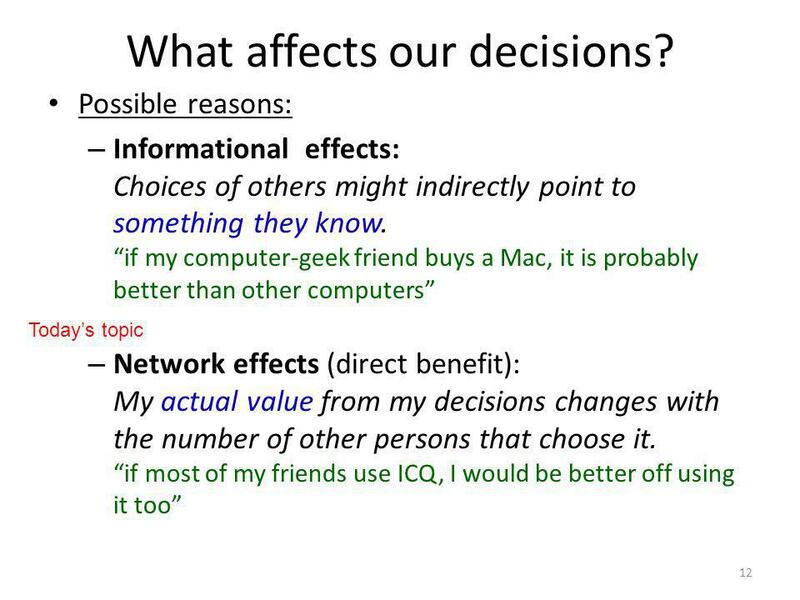 14 Network effects 14 My value from a product x is v i (n x ): depends on the number n x of people that are using it. 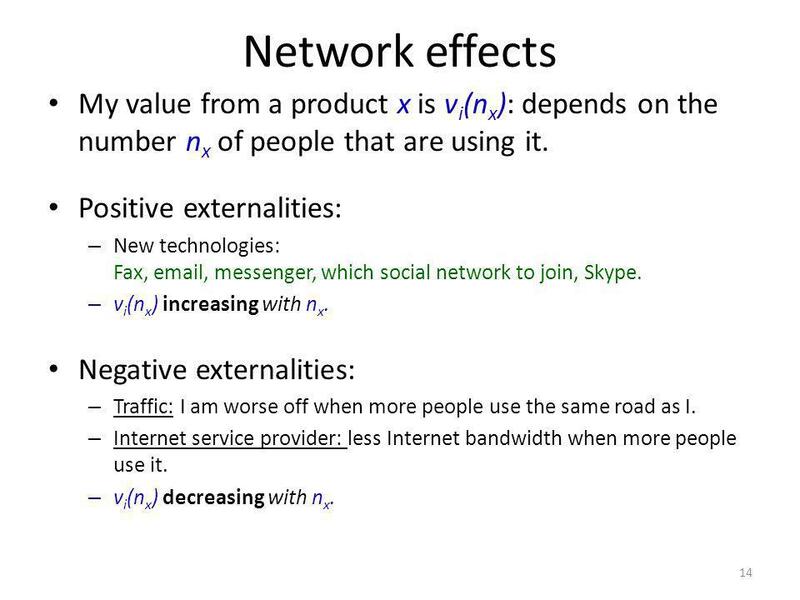 Positive externalities: – New technologies: Fax, email, messenger, which social network to join, Skype. – v i (n x ) increasing with n x. 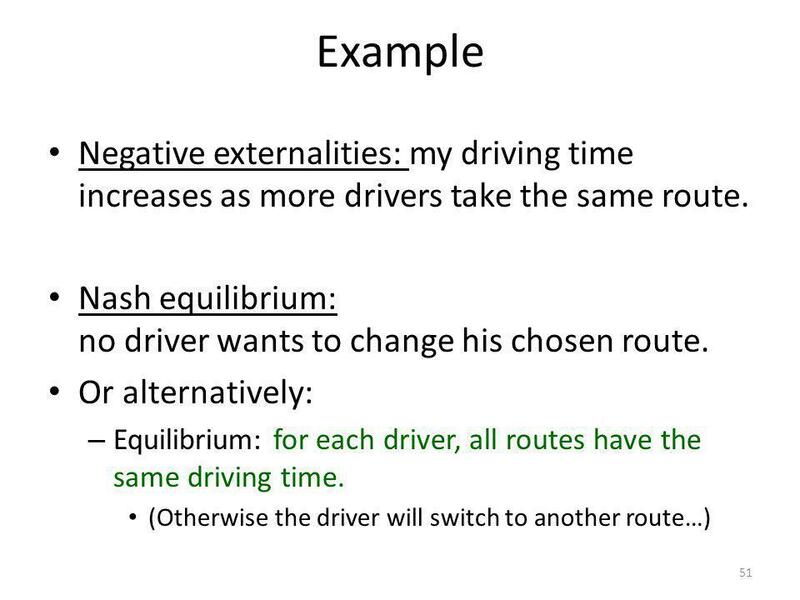 Negative externalities: – Traffic: I am worse off when more people use the same road as I. 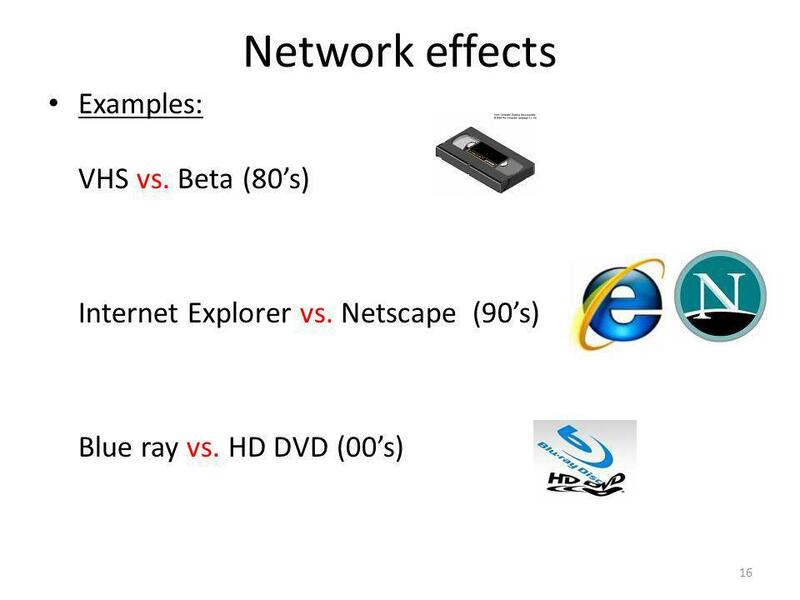 – Internet service provider: less Internet bandwidth when more people use it. – v i (n x ) decreasing with n x. 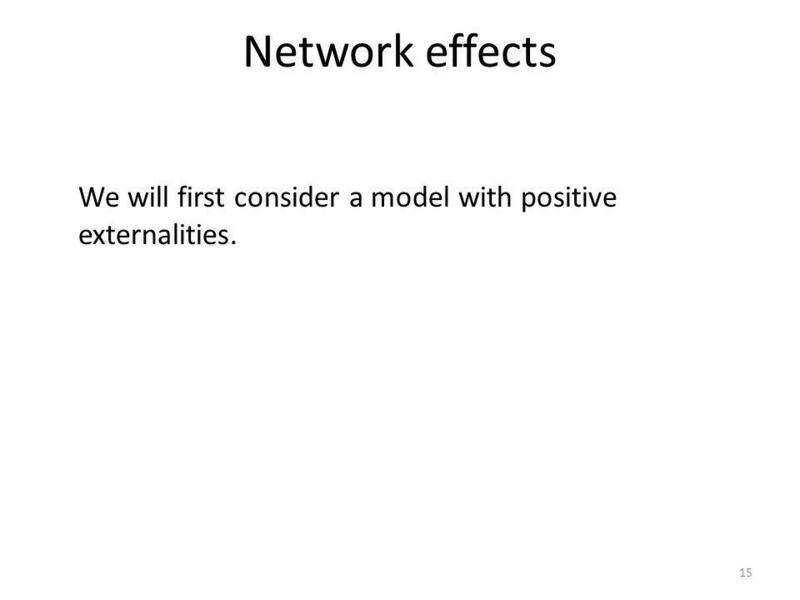 15 Network effects 15 We will first consider a model with positive externalities. 17 Diffusion of new technology 17 What can go wrong? 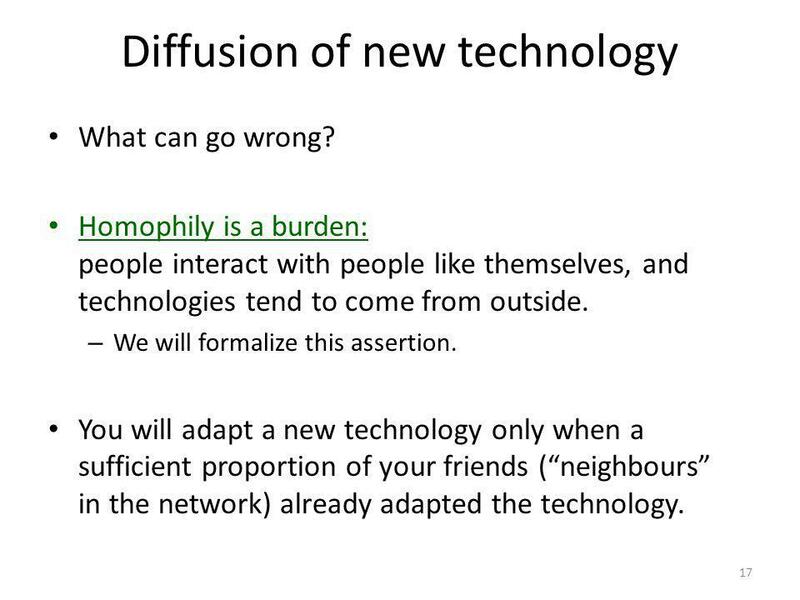 Homophily is a burden: people interact with people like themselves, and technologies tend to come from outside. – We will formalize this assertion. 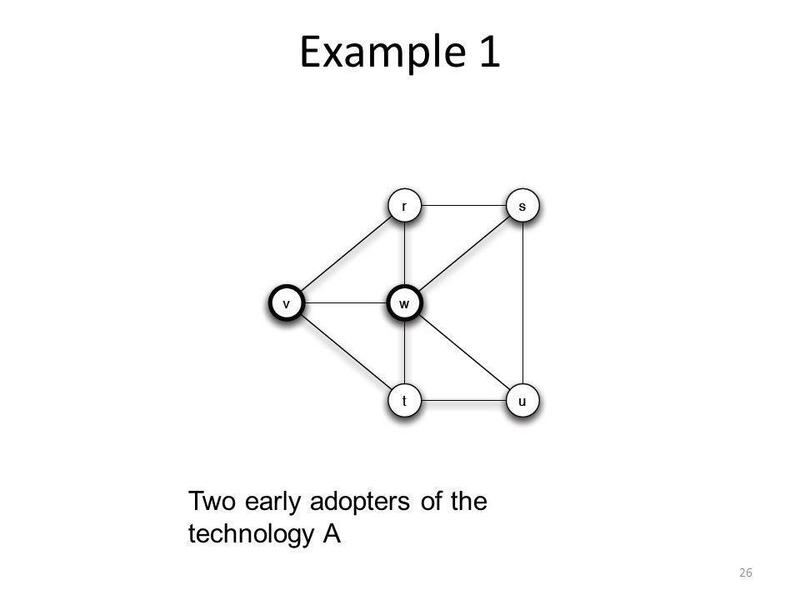 You will adapt a new technology only when a sufficient proportion of your friends (neighbours in the network) already adapted the technology. 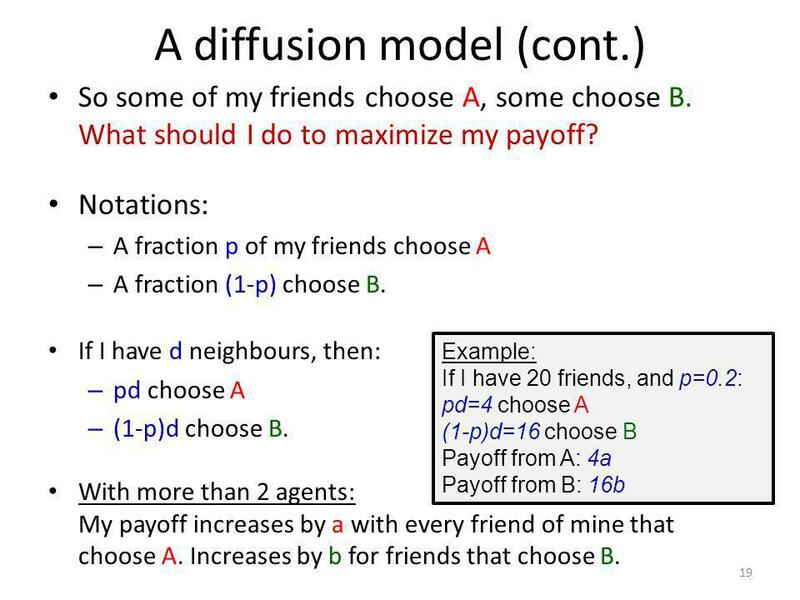 21 A diffusion model (cont.) 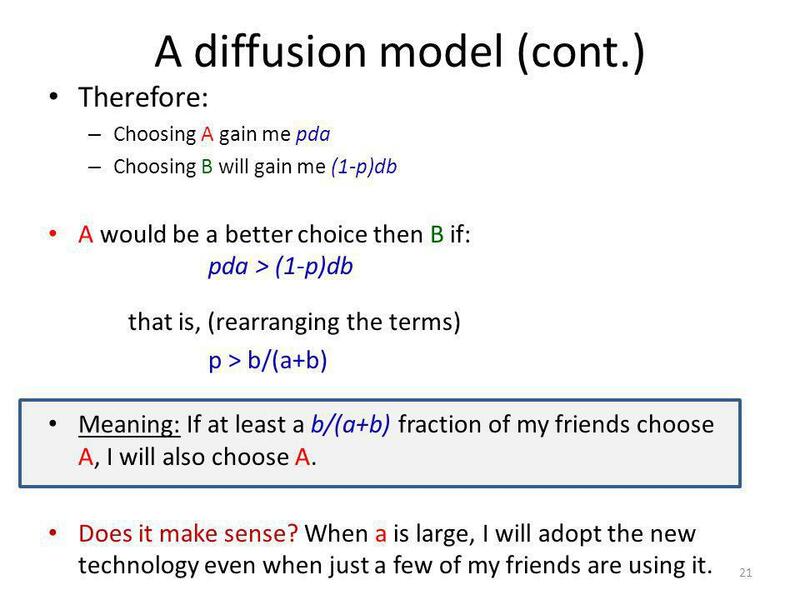 21 Therefore: – Choosing A gain me pda – Choosing B will gain me (1-p)db A would be a better choice then B if: pda > (1-p)db that is, (rearranging the terms) p > b/(a+b) Meaning: If at least a b/(a+b) fraction of my friends choose A, I will also choose A. Does it make sense? When a is large, I will adopt the new technology even when just a few of my friends are using it. 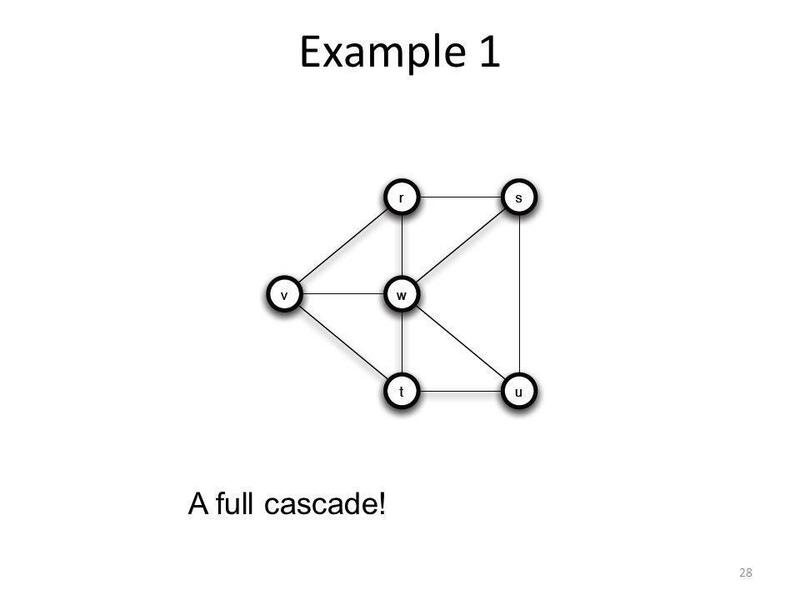 28 Example 1 28 A full cascade! 34 Partial diffusion 34 Partial diffusion happens in real life? – Different dominant political views between adjacent communities. – Different social-networking sites are dominated by different age groups and lifestyles. 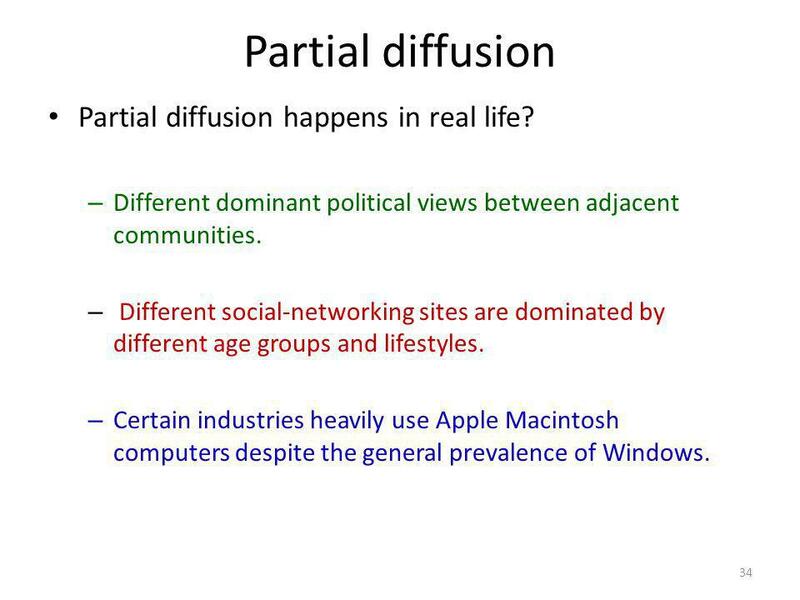 – Certain industries heavily use Apple Macintosh computers despite the general prevalence of Windows. 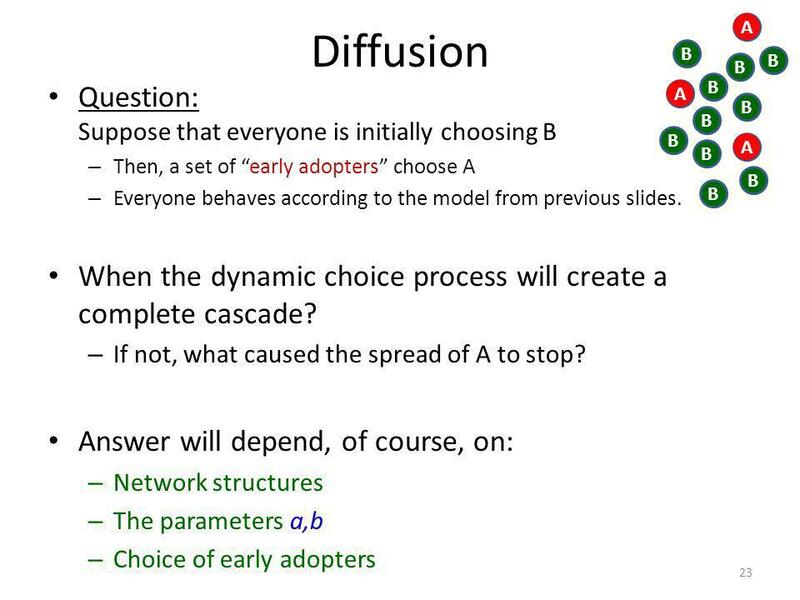 36 Example 2 36 For example: Convincing nodes 13 to move to technology A will restart the diffusion process. 37 Cascades and Clusters 37 Why did the cascade stop? 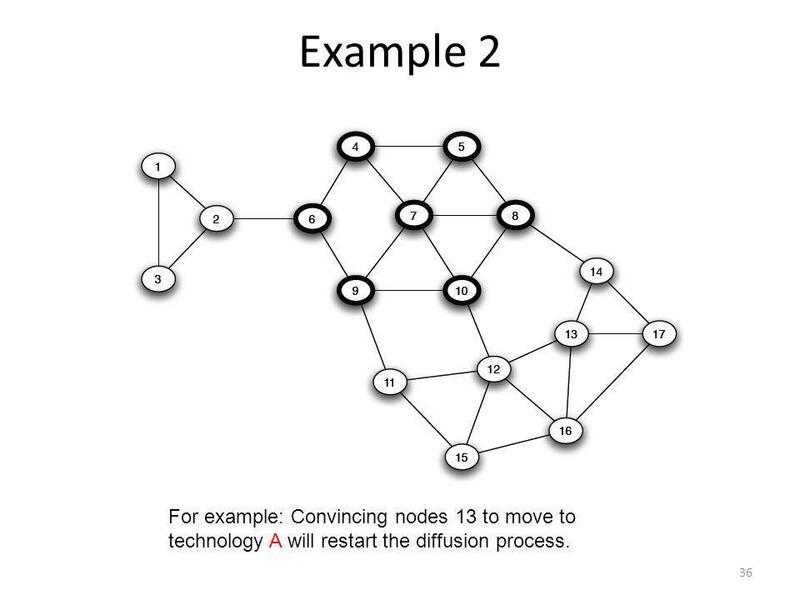 Intuition: the spread of a new technology can stop when facing a densely-connected community in the network. 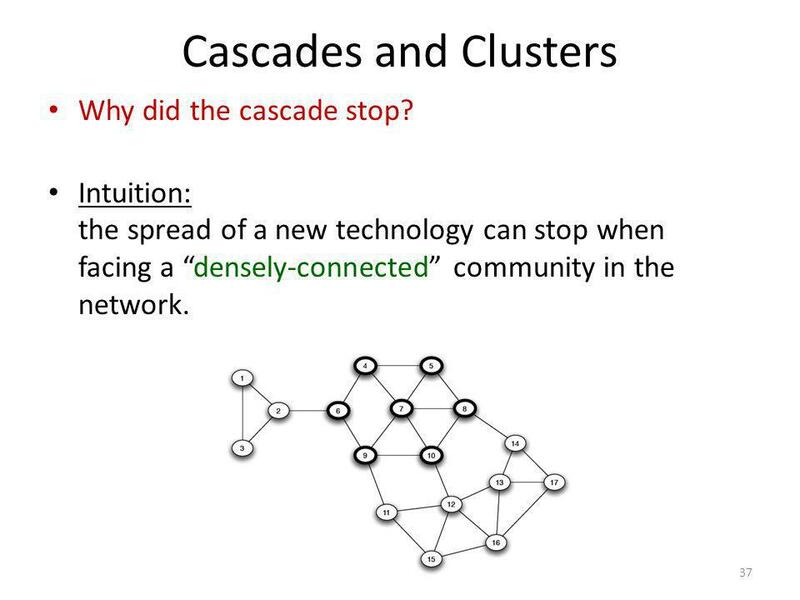 40 Cascades and Clusters 40 What is a densely-connected community? If you belong to one, many of your friends also belong. 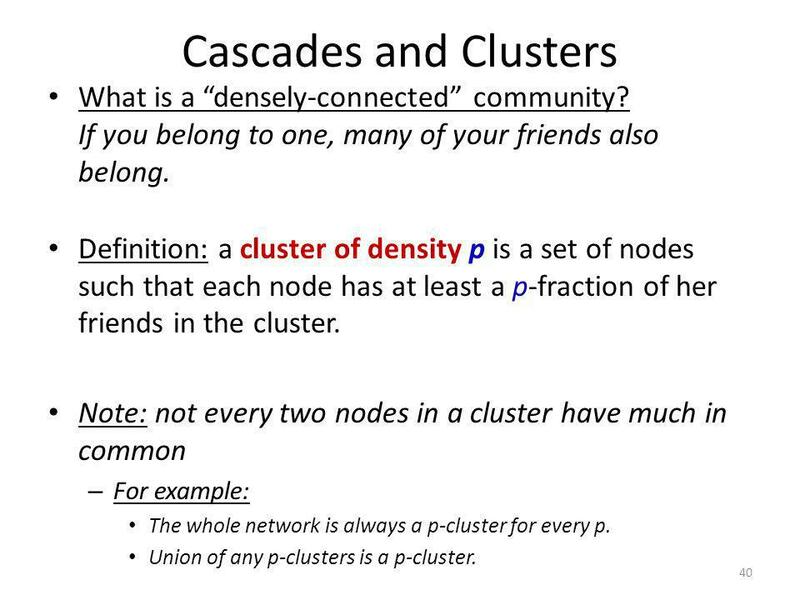 Definition: a cluster of density p is a set of nodes such that each node has at least a p-fraction of her friends in the cluster. 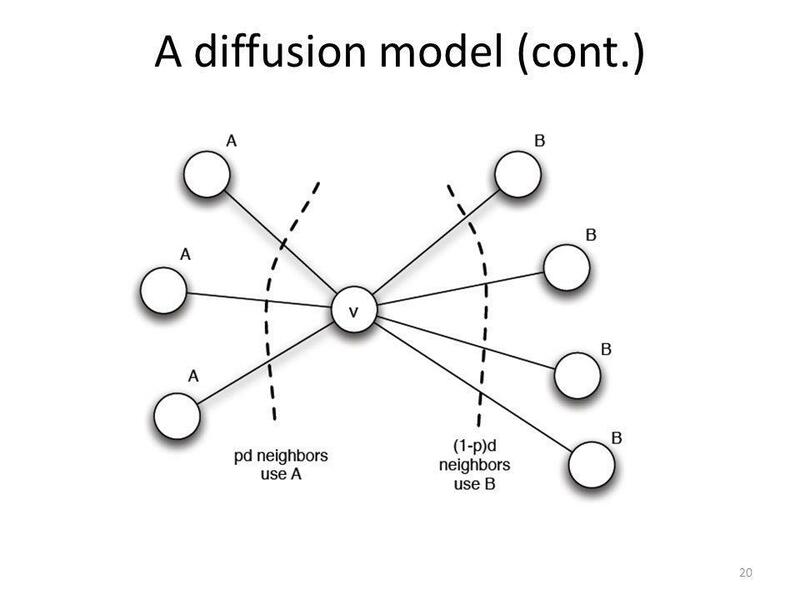 Note: not every two nodes in a cluster have much in common – For example: The whole network is always a p-cluster for every p. Union of any p-clusters is a p-cluster. 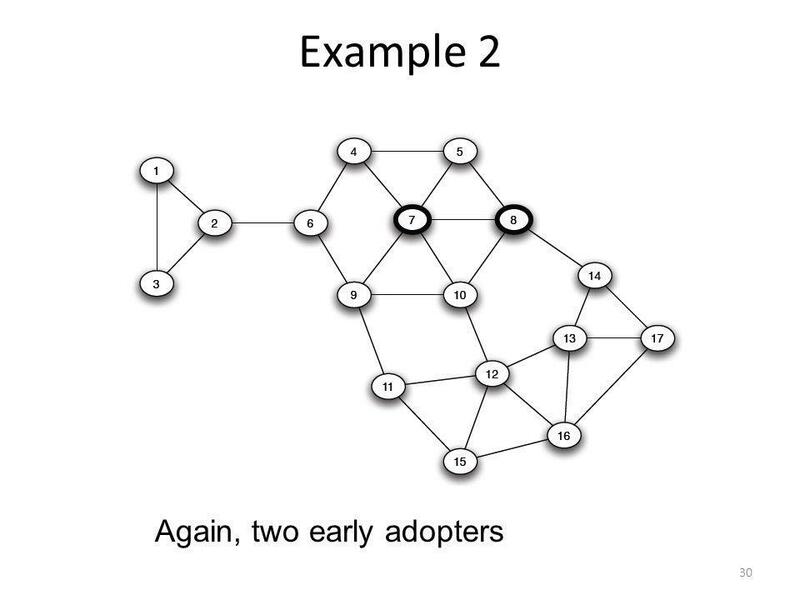 41 Cascades and Clusters 41 In this network, two 2/3-clusters that the new technology didnt break into. Coincidence? 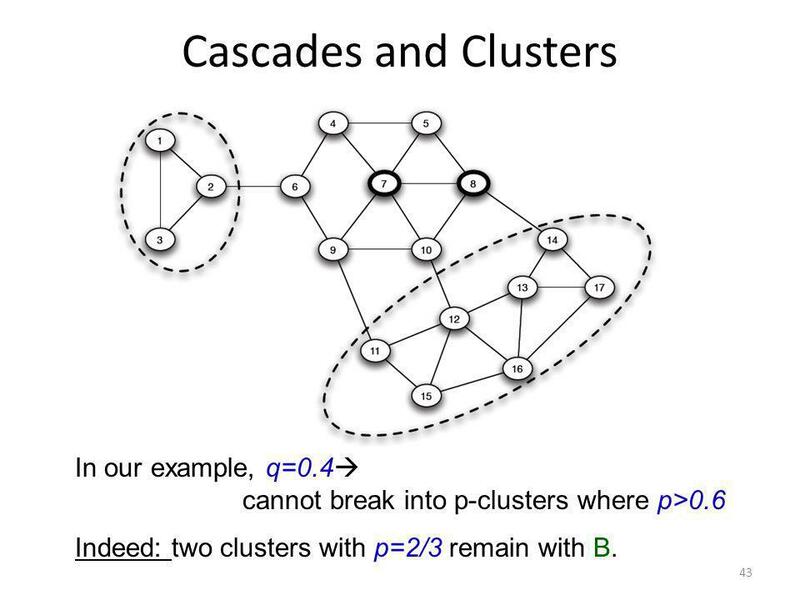 43 Cascades and Clusters 43 In our example, q=0.4 cannot break into p-clusters where p>0.6 Indeed: two clusters with p=2/3 remain with B. 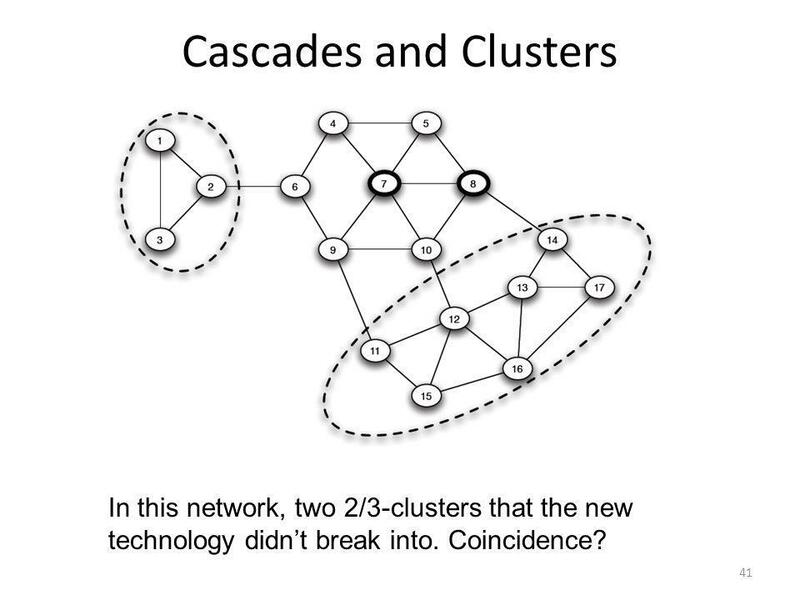 44 Cascades and Clusters 44 It turns out the clusters are the main obstacles for cascades. 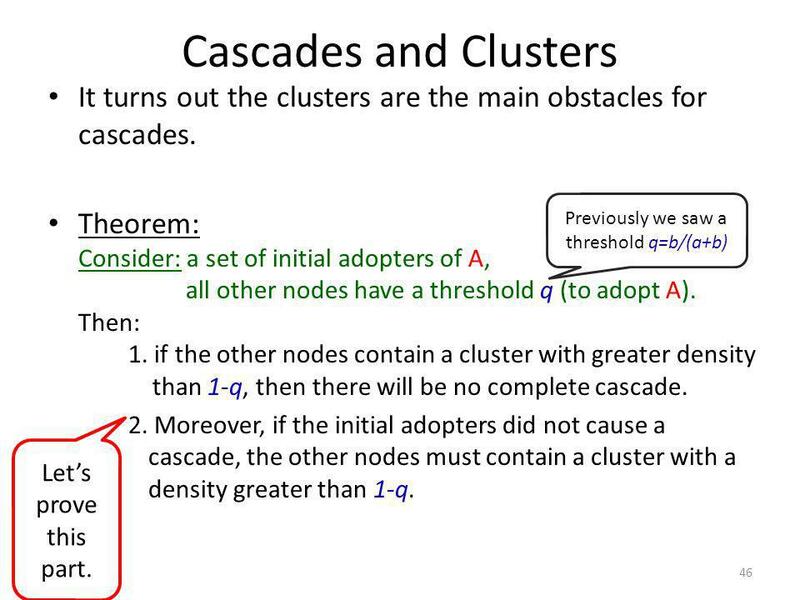 Theorem: Consider: a set of initial adopters of A, all other nodes have a threshold q (to adopt A). 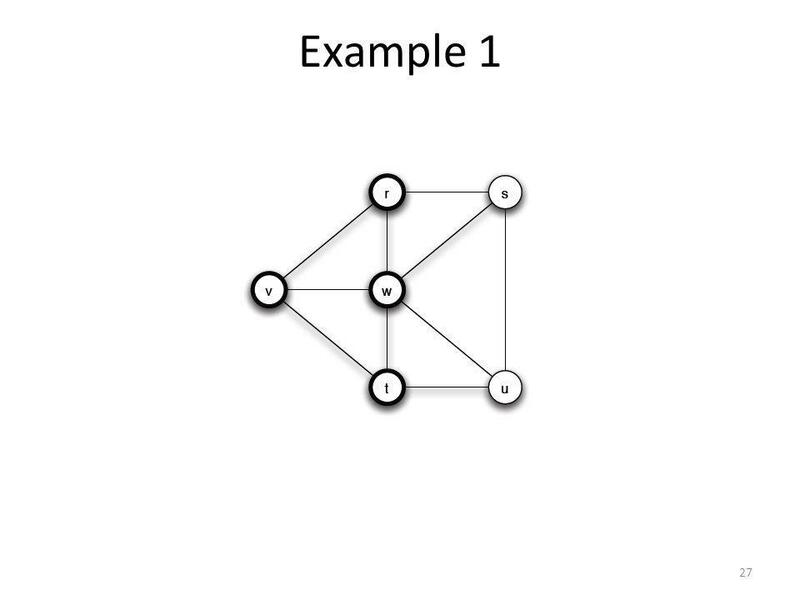 Then: 1. if the other nodes contain a cluster with greater density than 1-q, then there will be no complete cascade. 2. 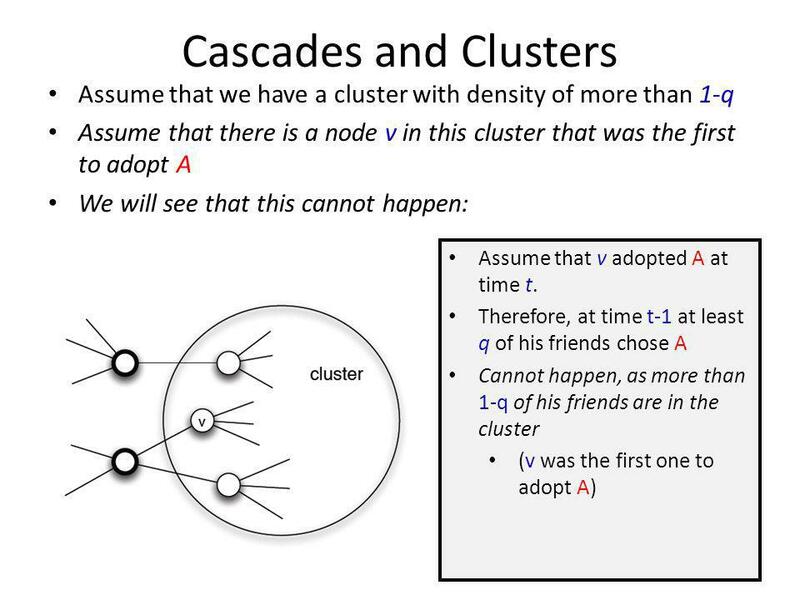 Moreover, if the initial adopters did not cause a cascade, the other nodes must contain a cluster with a density greater than 1-q. Previously we saw a threshold q=b/(a+b) Lets prove this part. 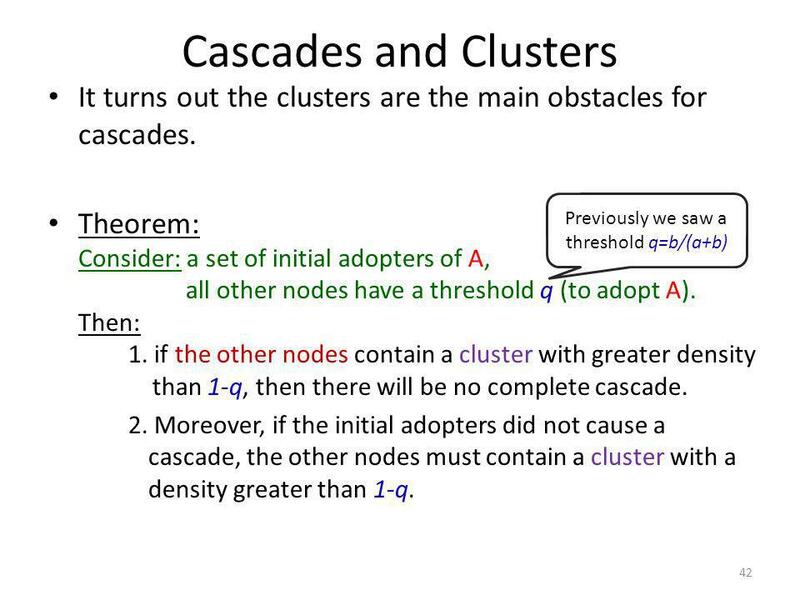 46 Cascades and Clusters 46 It turns out the clusters are the main obstacles for cascades. 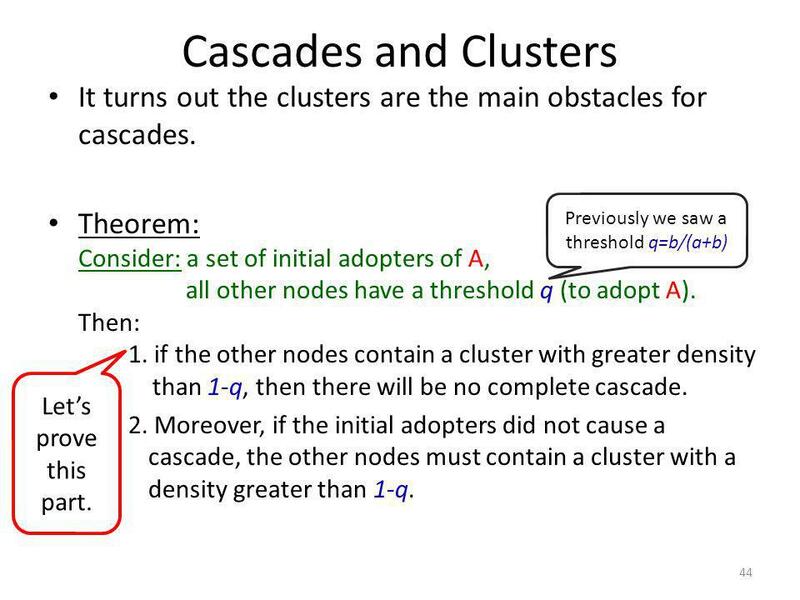 Theorem: Consider: a set of initial adopters of A, all other nodes have a threshold q (to adopt A). 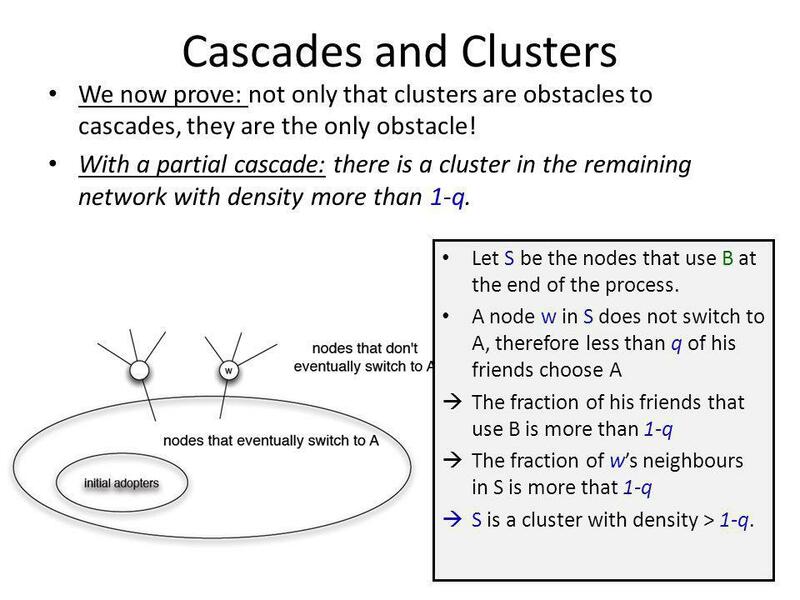 Then: 1. if the other nodes contain a cluster with greater density than 1-q, then there will be no complete cascade. 2. 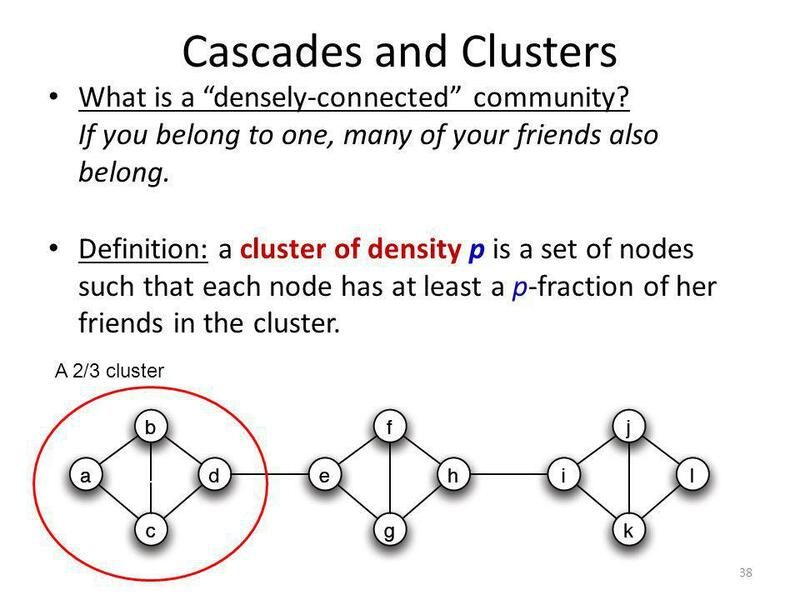 Moreover, if the initial adopters did not cause a cascade, the other nodes must contain a cluster with a density greater than 1-q. 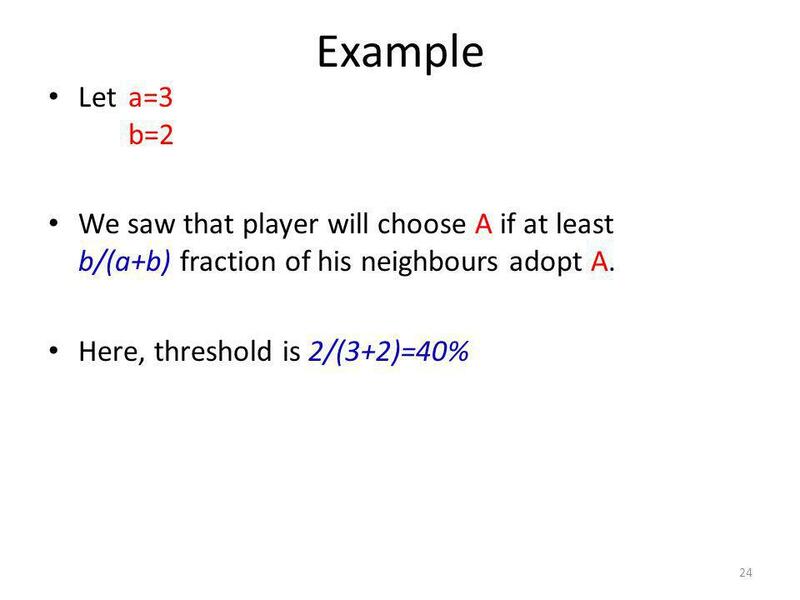 Previously we saw a threshold q=b/(a+b) Lets prove this part. 47 Cascades and Clusters 47 We now prove: not only that clusters are obstacles to cascades, they are the only obstacle! 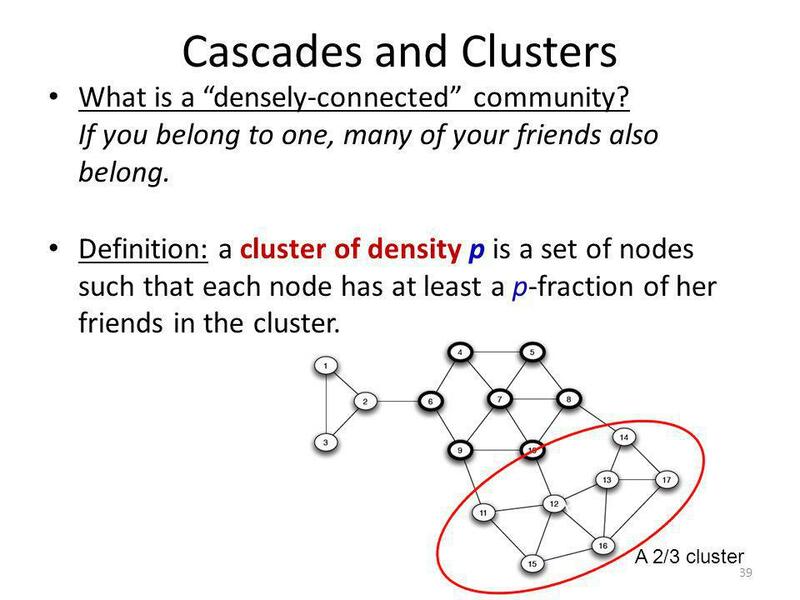 With a partial cascade: there is a cluster in the remaining network with density more than 1-q. 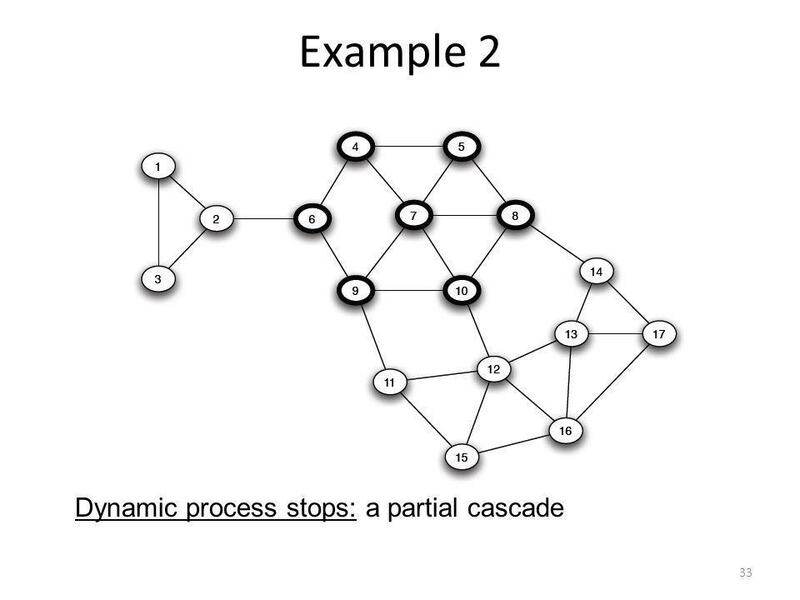 Let S be the nodes that use B at the end of the process. A node w in S does not switch to A, therefore less than q of his friends choose A The fraction of his friends that use B is more than 1-q The fraction of ws neighbours in S is more that 1-q S is a cluster with density > 1-q. 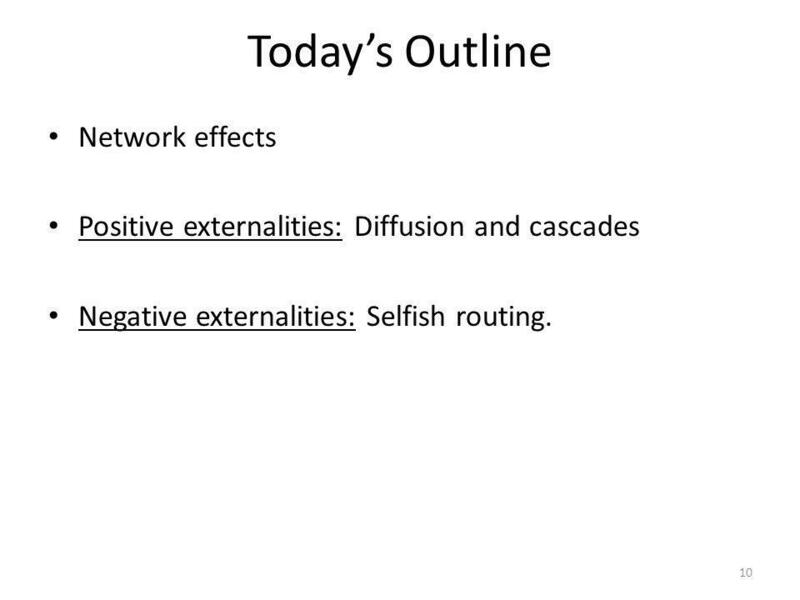 48 Todays Outline 48 Network effects Positive externalities: Diffusion and cascades Negative externalities: Selfish routing. 49 Negative externalities 49 Lets talk now about setting with negative externalities: I am worse off when more users make the same choices as I. 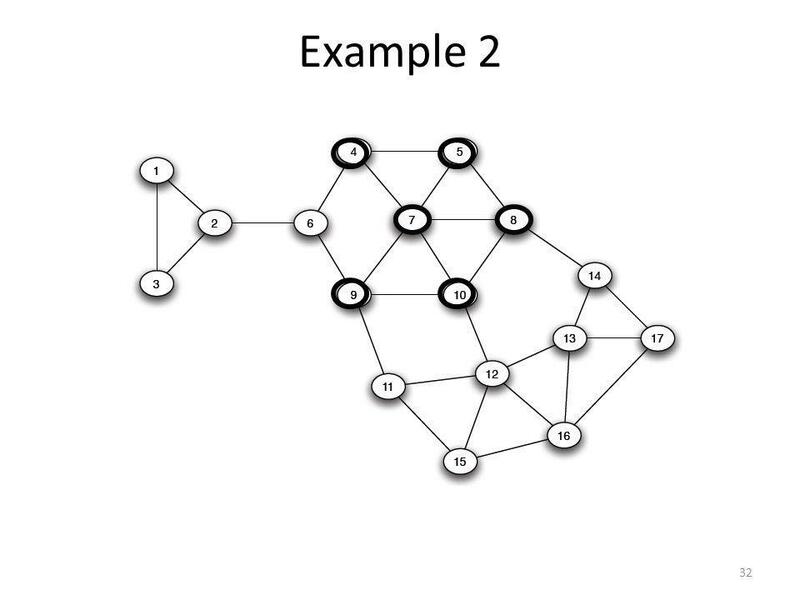 Motivation: routing information-packets over the internet. 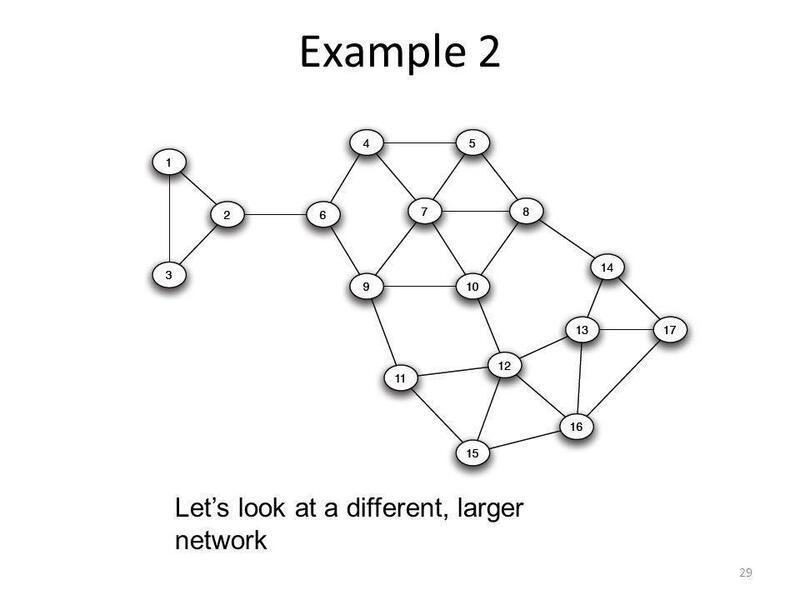 – In the internet, each message is divided to small packets which are delivered via possibly-different routes. 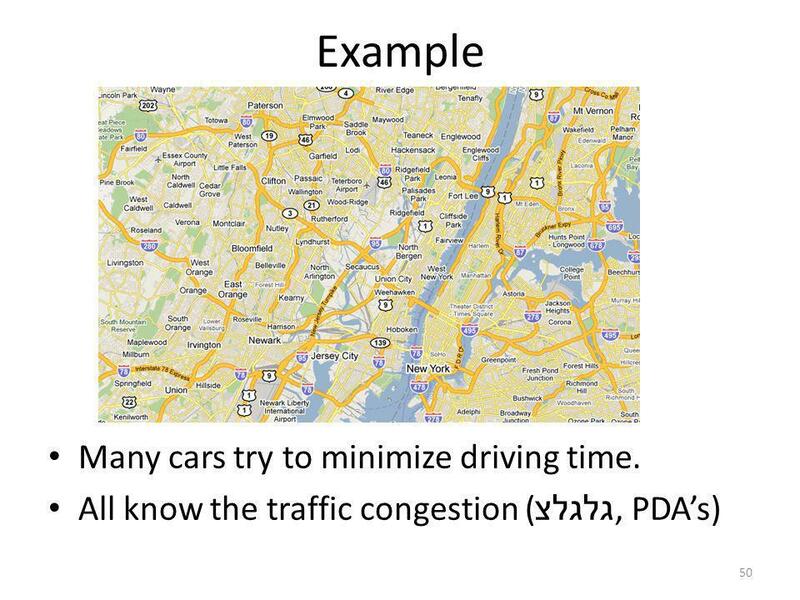 In this class, however, we can think about transportation networks. 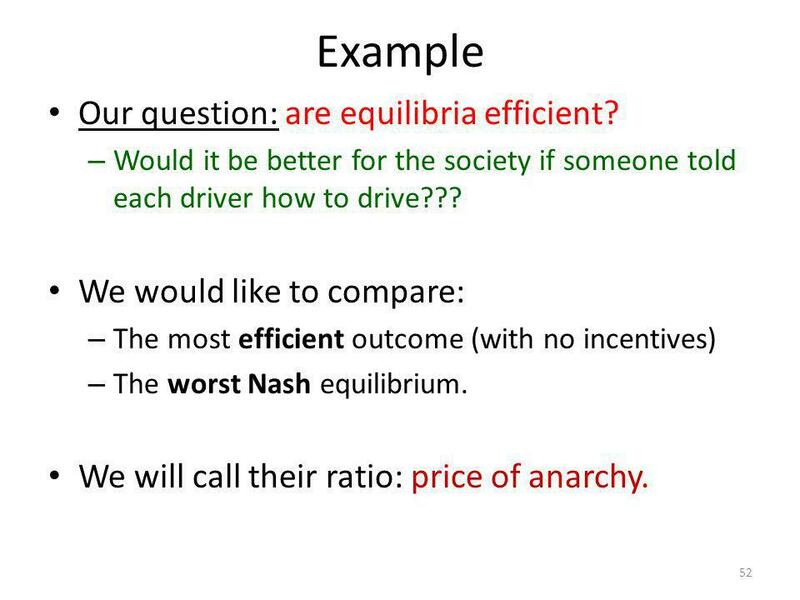 52 Example 52 Our question: are equilibria efficient? – Would it be better for the society if someone told each driver how to drive??? 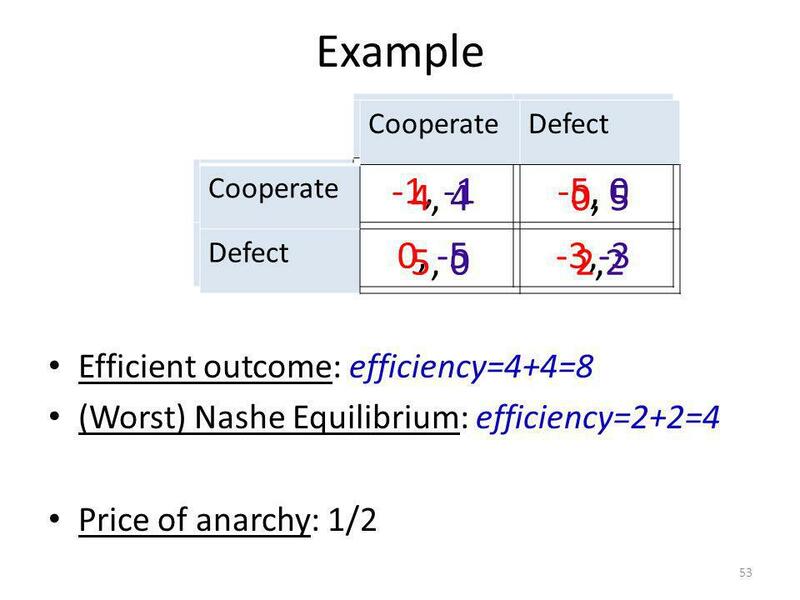 We would like to compare: – The most efficient outcome (with no incentives) – The worst Nash equilibrium. We will call their ratio: price of anarchy. 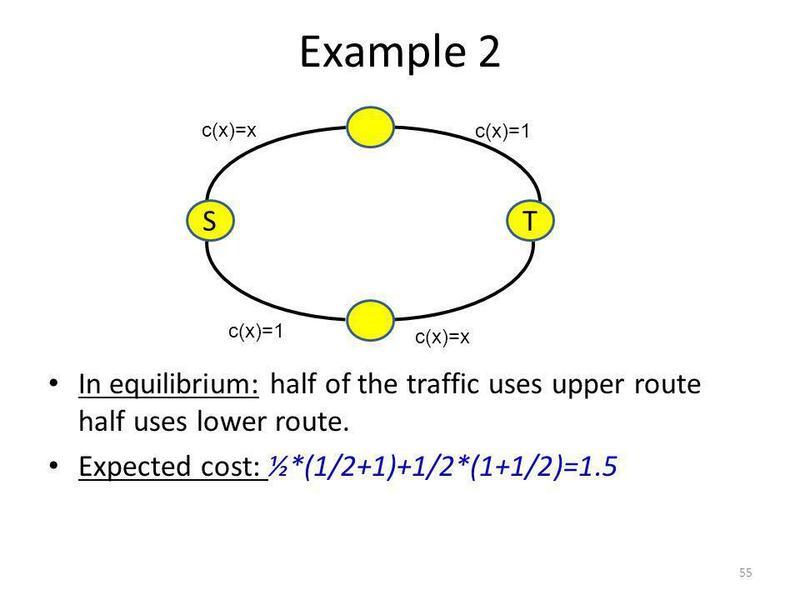 56 Example 3 56 The only equilibrium in this graph: everyone uses the s v w t route. 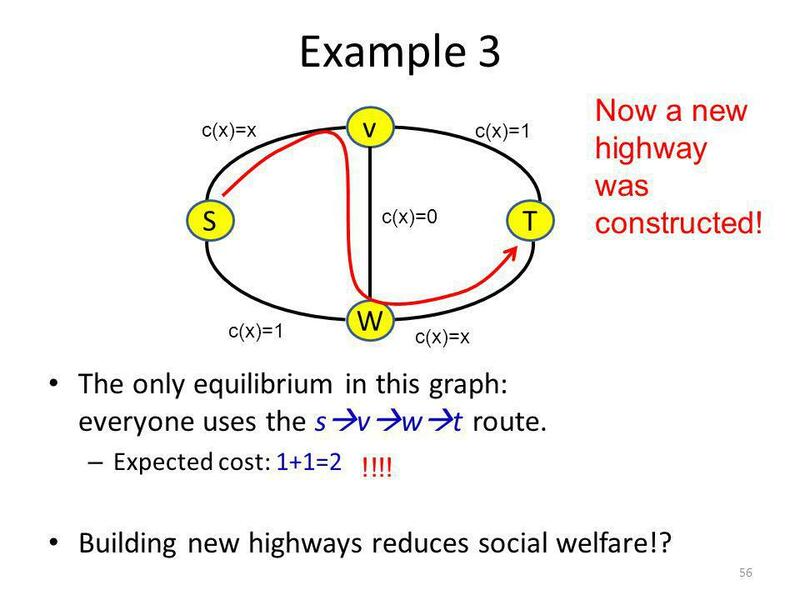 – Expected cost: 1+1=2 Building new highways reduces social welfare!? c(x)=x c(x)=1 ST v W c(x)=x c(x)=1 c(x)=0 Now a new highway was constructed! !!!! 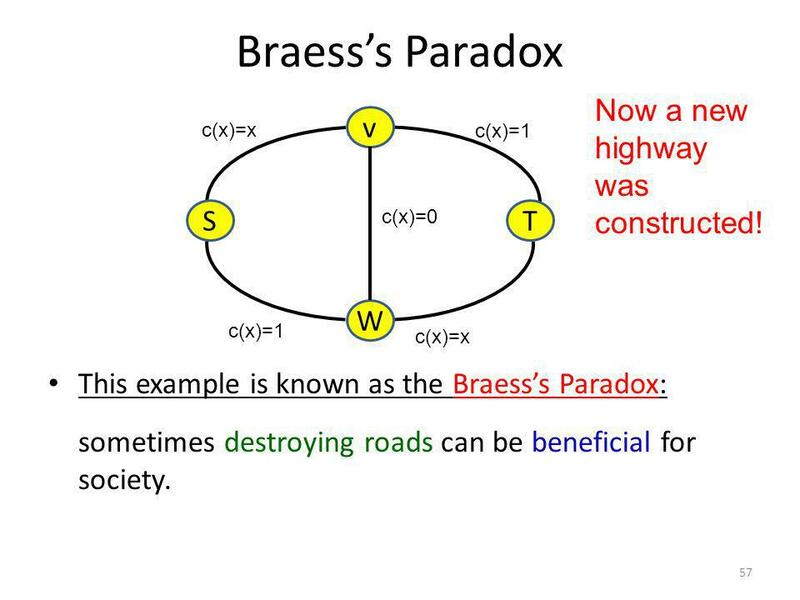 57 Braesss Paradox 57 This example is known as the Braesss Paradox: sometimes destroying roads can be beneficial for society. c(x)=x c(x)=1 ST v W c(x)=x c(x)=1 c(x)=0 Now a new highway was constructed! 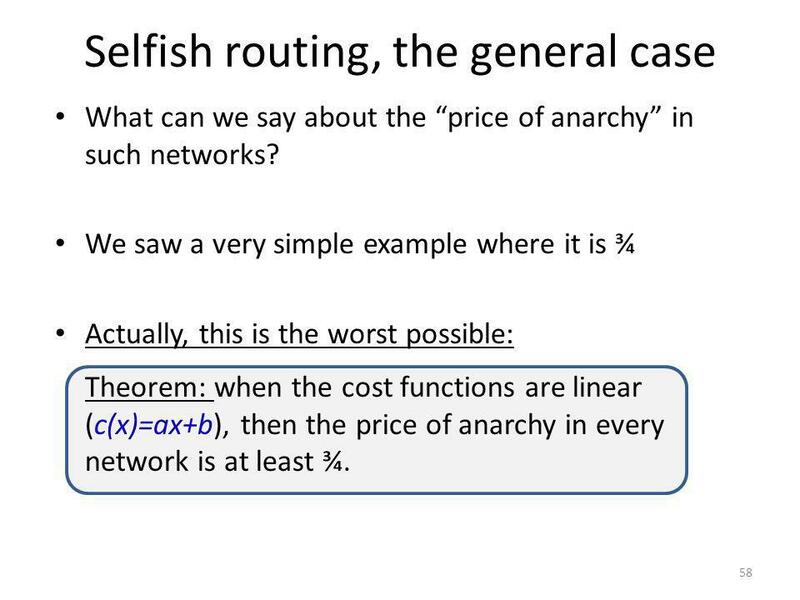 58 Selfish routing, the general case 58 What can we say about the price of anarchy in such networks? 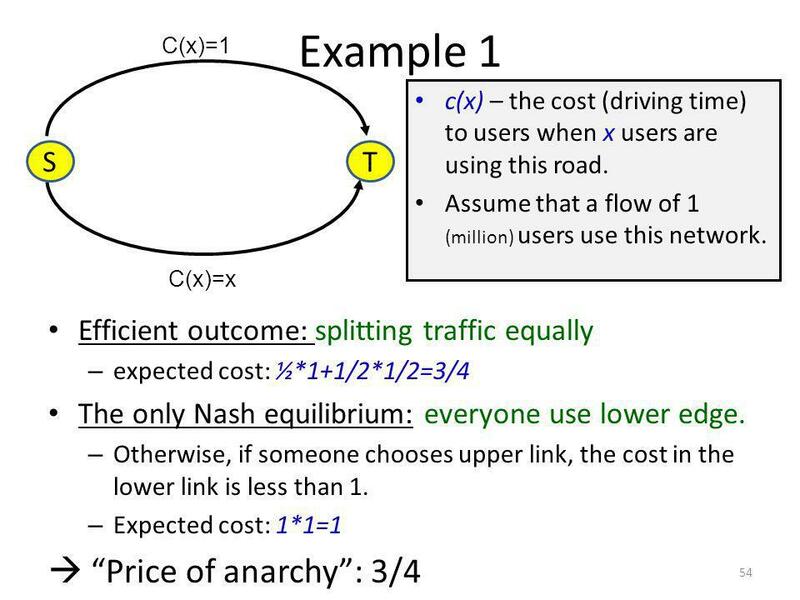 We saw a very simple example where it is ¾ Actually, this is the worst possible: Theorem: when the cost functions are linear (c(x)=ax+b), then the price of anarchy in every network is at least ¾.
Download ppt "Internet Economics כלכלת האינטרנט Class 11 – Externalities, cascades and the Braesss paradox. 1."